A long time ago, in the vastness of space, there existed only two elements - Fire and Water... This meant epic war, and nothing could stop them... Oh, well, except their mutual buddy Air. :) United together, the elements started to create and found that they could invent anything! Unleash the power of these amazing elements to perform a miracle of creation! Blast these gems of elemental magic and fill your very world with wonders and marvels! Create a flourishing world full of color, joy and sweetness! 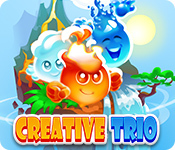 Creative Trio is rated 2.0 out of 5 by 10. 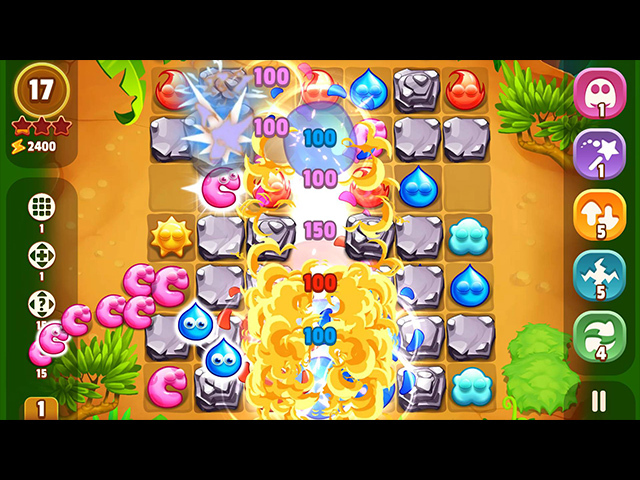 Rated 5 out of 5 by granp1 from Mindless fun with but not without some skill I love the simple nature of this game and although at first it seems easy, strategy and thought are needed for the three star result, my only issue is how to restart the game from the beginning to play again! I loved it and would recommend it. Rated 4 out of 5 by travelama from Cute, "Creative" Match 3 with Some Challenge Thought I'd chime in with my review since there are so many negative ones for this game. I liked it and bought it. The element characters are cute, and the "creating reactions" aspect is interesting. Yes, sometimes you need to replay a level a few (or several) times, especially if you're trying to earn three stars. But the game is certainly not mindless and requires some strategic planning to make way for matches. I'd recommend trying it for yourself before allowing negative reviews to dissuade you. Rated 2 out of 5 by scroungegirl from Looked to be fun, but wasn't Not sure who this is for. Looks like it's aimed at kids, but I quit after 10 times on level 6. The time limit is too short for me, and to retry, you must go through all the setup and explanation for the level again. Didn't mind the "creating reactions", except that they didn't make sense all the time. I'm not even finishing the demo. Rated 2 out of 5 by twtscat48 from Creative Trio not recommended I played this game for a little bit, I found it frustrating that you couldn't change the game to relaxed whatever. I don't like having to get things done by so many moves. 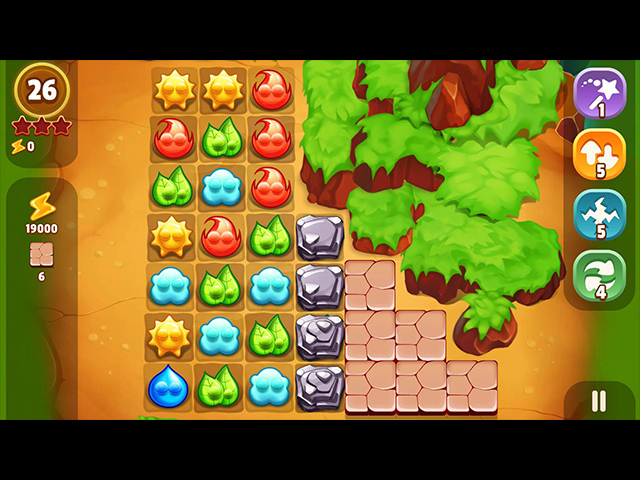 It's hard to get some levels without playing several times. I gave up and will not be buying this game. I don't recommend this game!!!! Rated 2 out of 5 by shihtzumum from Elements of Awfull At first I thought this could be a kids game, learning about the elements that make up certain other elements, but then it got weird. I failed level 6 (4) times and only received 1 star when I finally got it. I failed another level, but only a couple of times. Then on 13 or 14, I made such a big chain that the game crashed. Too tough for most kids and not enjoyable for adults. I say pass on both ends as kids could get frustrated and leave. Rated 1 out of 5 by caircair from Impossible to continue Like many, got stuck on level 6 but finally (after multiple tries) got through it. 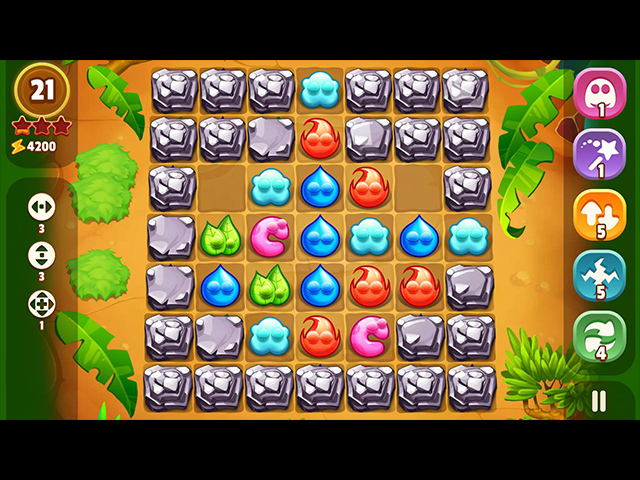 Then on level 11 (Create Plant) was completely unable to finish that level in the moves allotted. This game is either super-buggy or super-impossible. If I could give fewer than one star, I would. Don't waste your money! Rated 1 out of 5 by LBF242 from TERRIBLE GAME I love match 3 games with a challenge to them but this is dumb, weird and not worth playing. And why are there elements to be made before you can go to the next level that to me has nothing at all to do with match 3. There is no way to change the mode to relax and at times it is so childish and boring. DO NOT WASTE YOUR MONEY ON THIS ONE. Rated 1 out of 5 by madgicsh from AWFUL! Strictly for those who want hand activity without any brain involvement. Rated 1 out of 5 by scarletta06 from verybad this game is very stupid . I do not like.